The following is an email correspondance with Biblical Anthropologist Susan Burns. Susan and I had the opportunity to meet last summer in Washington. She is bright, articulate, highly intuitive and a great stimulation to my research. Susan writes, "A point I am trying to make in my blog is that unless we incorporate the contribution of religious tradition, we will never understand what has made us human." I am very curious about your views on human evolution. For some reason, I assumed you agreed with Darwin's basic premise although I can't remember what post I read that brought me to that conclusion. Could you elaborate on your views? I am sure they are very insightful. You stated that H. Afarensis was human and I would love to hear your reasoning on this subject. Although it is difficult to determine what is the criteria for "human", I am sure your opinion is more informed than most. I say that because of the same reasons you outline in your frustrations about young earthers. IMHO Australopithecines have the dentition for papyrus consumption so that is the human line of descent. I am not hung up on race but there is some kind of genome relationship to the sons of Noah. What a beautiful design! First we are isolated and evolve adaptations to regional conditions and then we are mixed together and use the best of the variables for new adaptations. Which brings me to the million dollar question: How do you reconcile Genesis and Darwin? The Young-Earthers' simplistic view that the races came from the three sons of Noah is without support in genetics and in Genesis. Distinct populations descend from them, but not races. I discuss this here. Evolutionists speak of "species" and "genus" and paint a picture consistent with their ideology. They persist in classifications that confuse people. A species is either human or ape. Darwin's view that we share a common ancestor remains unproven. The differences between ape and human fossils is obvious. I prefer to speak of archaic human populations and modern human populations. That there are some anatomical differences between these is not indicative of evolutionary branching but is evidence of human adaptation to environment. Additionally, a range of anatomical features is to be expected among human populations that were isolated and practiced endogamy. This is one of the observations Darwin made concerning the isolation of species. Further, most archaic populations lived in dense rain forests in the equatorial belt. They were well adapted to the heavy wet conditions. This is indicated by the evidence of air sacks in the throat, as do apes of the tropics. However, this does not mean that these human populations evolved from apes or that humans and apes had a common ancestor. It simply means that Darwin was right about adaptability of species. Humans exhibit great adaptability. I agree with you that this has been divinely guided. In the Bible, Adam and Eve represent the First Couple created by God. If this is historically true, they would have lived before 3.6 million years ago. That is when A. afarensis lived in tropical Africa. There is no reason to assume that A. afarensis were not human. The morphology of the hyoid that suggests this population had air sacks in the throat is not indicative of them being apes. The same hyoid bone shape has been found in other human populations as an adaption to jungle or tropical environments such as existed in Israel around 60,000 B.C. Similar hyoid structure was found with the archaic population that lived in the Kebara Caves in Israel. All other traits of A. afarensis indicate that this population was fully human, including evidence of controlled fire. When it comes to natural selection, human populations are unique among animal species. Many factors have an impact on human survival and adaptation. These include imagination, innovation, diplomacy, intuition, collective memory, kinship and non-random mating structures. Molecular genealogists recognize mating structure as a key factor in genetic flow. This is where my research on the marriage pattern of Abraham's Nilotic ancestors comes into play. This unique marriage pattern was well established among Abraham's ruler-ancestors between 4000-3000 B.C., and the ascendancy of firstborn sons by two wives drove the migration out of Africa into Mesopotamia and into West Central Africa. I have no doubt that A. afarensis was an archaic human population. The term Australopithecus afarensis was coined by South African anatomist Donald C. Johanson. These remains were first found in Hadar, Ethiopia in 1973. For about 20 years A. afarensis was described as the earliest known “human ancestor species.” Australopithecus means “Ape of the South” and afarensis refers to the Afar Triangle of Ethiopia where the fossils were found. Johanson now recognizes that this was an archaic human species. The first discovered skeleton of this population was named "Lucy" and she was described as Homo by Mary Leakey. She was not pleased with Johanson's attempt to classify her Hadar find as ape. Since 1974, many more A. afarensis bones have been found, mainly in Cameroon, Ethiopia and Tanzania. All are at least 3 million years old. The bone structure reveals that these were archaic humans. They were erect and had human ankle bones. As you point out, the Australopithecine had human dentition. I agree that dentition for papyrus consumption is indicative of early archaic humans. This would be expected for river, coastal and marsh populations. Archaic humans lived near the major water sources which ancient rulers came to control. All the evidence surrounding the Australopithecine points to archaic humans. They walked upright, used butchering tools and controlled fire. Further, it appears that they shared food which they gathered/hunted collectively. This has never been observed among apes, as far as I know. Darwin's theory does not propose humans evolved from apes. It simply says we have a common ancestor. Although I am sure you are aware of this, it does seem to be a sticking point with Young-Earth Creationists. Your point about air sacs is really key. Humans did evolve in wet conditions as I point out in my blog. Before I had my children, I was extremely inspired by a book I read called "The Aquatic Ape" by Elaine Morgan. She outlines all of the attributes humans share with aquatic mammals. I was extremely inspired by Morgan's work and used my own children as guinea pigs. Both girls could float and propel themselves underwater and on their backs before they could walk. You and I seem to have very similar views and are just a few degrees on either side of the dividing line of Darwin's theory. Although I am an evolutionist, I am not an atheist and I find that it is almost impossible to talk with secular scientists about the effects of religious traditions on the evolutionary process. I would agree with your frustration with Young-Earthers and extend that frustration to anthropologists. At least Young-Earthers are usually civil. I am still somewhat unclear on your view of the origin of H. Afarensis. Do you think archaic humans came from a completely separate line of descent that does not share a evolutionary branch with other primates or even hominids? I am a creationist. I believe that from "the beginning" God created humans in the divine image and fully human, and that humans and apes have always been separate species. As far as I have been able to determine, finds labled "hominids" in evolutionary taxonomy represent different archaic human populations. After almost 100 years of frantic searching, there remains no material evidence that humans and apes had a common ancestor. This aspect of Darwin simply has not been proven. Until it is, I feel no compulsion to relent in my position. That's the empirical approach, afterall. This doesn't mean that I reject a role for natural processes. These can be observed. I wonder why such observations must be forced into Neo-Darwinian interpretations. The air sacs being an example. Many features that Darwinians insist are evidence of evolution have other likely explanations. The morphology of the hyoid that suggests that A. afarensis had air sacks in the throat is not indicative of evolution of humans and apes from a common ancestor. The same hyoid bone feature has been found in other archaic human populations as an adaption to aquaboreal environments. Similar hyoid structure appears in the Kebara Cave population of Israel that lived around 60,000 B.C. Are you familiar with the BioLogos Group? Their website might interest you. They are theistic evolutionists, mostly Evangelical Protestants. BioLogos sees evolution as the means by which God created life, in contrast to Atheistic Evolutionism, Intelligent Design, and Creationism. Personally, I think they try too hard to align Darwin with Genesis. Genesis isn't about the origin of the universe and life on Earth. It is about the origin of Messianic expectation among Abraham's Nilotic ancestors. Their focus on the evolutionary angle causes people to lose sight of this. I too have found it nearly impossible to discuss the impact of religion on human advancement with secular or atheistic Darwinians. Religion simply does not fit into their Materialist worldview. They are ignorant of ancient civilizations and dismiss the importance of this knowledge because in their evolutionary scheme, humans have evolved to a higher consciousness. Therefore the ancient past has little to teach us. Materialists recite a litany of Dawkins' writings and his ignorance of ancient civilizations is shocking. When I bring up examples of how religion is the early foundation for science, materialists dismiss this. 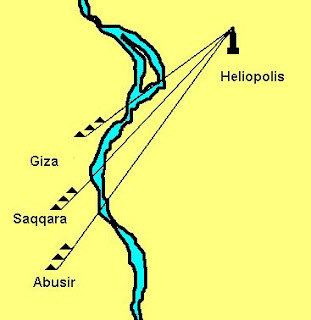 Recently, I cited the example of how the trinity of pyramids of Giza, Saqqara and Abusir aligned to the temple of Horus at Heliopolis, and in reply, I was told that this could just as easily have been the work of aliens! The Biologos group is heavy on the logos and light on the bio. They do try very hard but everything I read was conjecture. Genesis may be about Messianic expectation but its backdrop is an archaic world view that could provide invaluable insights. However humanity evolved, its story is told in the ethnography of religion. Why this resource is not being exploited is unfathomable to me. Comparing the air sacs of humans to other indigenous primates places the ancestor of man and ape someplace in equatorial Africa. The air sac adaptation allowed this ancestor to adapt to ever wetter environments. While the ape branch became more specialized by knucklewalking, the human branch acquired more aquatic adaptations. Hairlessness, adipose fat distribution, deep diving reflex, ear ichthyosis, even upright walking allowed Pithecines to exploit the semi-aquatic ecosystem of tropical papyrus swamps. All primates are arboreal but the pithecine branch was apparently aquaboreal. Their forest ecosystem was cane. The aquaboreal ecosystem that nurtured early man must have been coastal. The reason is our need for so much salt. Human blood contains .9% salt and is crucial for healthy brain development. Every bodily system down to the cellular level uses salt to function normally. It is especially important for pregnant women to get enough salt. Babies are able to tolerate much higher levels of salt than adults. This is why I think the aquaboreal home of early man was a brackish swamp. This brackish swamp also needed an inflow of fresh water. Babies need so much water! They spit up almost as much as they take in. The reeds were used to fuel fires, make sleeping mats, sandals, boats, and papyrus paper and its flowers were offered to the Virgin Queen Hathor at river shrines and temples. The papyrus reed and its flowers symbolized the Upper Nile. The sema (shown right), with its segments, represents the papyrus reed. It was the symbol for the Upper Nile and the sema-tawy, composed of lilies and papyrus reeds knotted around the hieroglyphic sign for union, was the symbol of the union of the Upper and Lower Nile regions. These regions were first united by Menes. Suph is the Biblical word used for papyrus. Chufa is derived from suph and was introduced to Spain by the Moors. Chufa is a papyrus tuber that is found in hot, wet regions. Harvesting chufa would have required wading in water much like rice farmers. Since women are the traditional gatherers, we carry the subcutaneous adipose fat on the lower portion of our body as insulation. The hourglass shape of women is an adaptation IMO to suph gathering. You make an excellent point, Susan. I'm reminded of the women of the Orissa region of India and southern Nepal who wade in water to harvest the rice. They are in the Harwa population. Harwa meant "priest" in ancient Egypt. These women are descendants of the Kushites who migrated out of Africa. I read that the ancient suph became extinct in Egypt. In Cairo the specimen is preserved for public viewing in a museum. RE: "I too have found it nearly impossible to discuss the impact of religion on human advancement with secular or atheistic Darwinians. Religion simply does not fit into their Materialist worldview." Another example of this is the newly-formed Religious Studies MA/Phd Degree at UC Davis which will not be discussing theology in the program. When you divorce the yearning for a relationship with God from the practice, art or performance of any faith, you have a cultural study, not a religious study, in my opinion. “Religion has become absolutely central to how people think about the world and their own communities, and we’ll be aiming to train our graduate students to help others think through the complexities of religion as a faith and as a force for positive change,” said Miller. As a force for social change by a group of academicians? What is this? Acknowledge the shell of faith, but discard the moral and ethical structure faith gives us living relationship with one another? The UC David Religious Studies Program is the norm. There will be no real breakthroughs in such a closed arena. Biblical Anthropology has the potential to connect many dots, yet this discipline is not offered at a single degree-granting institution in the world. Makes one wonder what the Materialists fear? If there is nothing to fear from the work we are doing, why not recognize and fund the work? As a point for continued conversation, Casey Luskin (Discovery Institute - ID) maintains that the recent complete sequencing of the gorilla genome challenges the theory that humans and apes have a common ancestor. Luskin says, "There is not a clear signal of ancestral relationships that is coming out of the gorilla genome once you add it into the mix." It isn't nice out there for people who don't agree with the convention of Evolution!